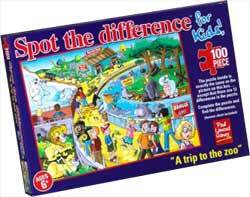 Spot the Difference Puzzles are puzzles with a difference... in fact 12 of them. The puzzle in the box is exactly the same as the image on the box except for 12 differences. Make up the puzzle and see if you can spot all the differences. We do include a list if you get stuck... but no cheating!